Three young men from very different backgrounds come together in a journey from India to England, where they hope to begin something new. To support their families, where they can, to build their future, to show their worth, to escape the past. They have almost no idea of what awaits them. In a dilapidated shared house in Sheffield, Tarlochan, a former rickshaw driver, will say nothing about his life in Bihar. Avtar has a secret that binds him to the unpredictable Randeep. Randeep, in turn, has a visa-wife in a flat on the other side of town, whose cupboards are full of her husband’s clothes, in case the immigration men surprise her with a visit. Utterly absorbing and beautiful in its scope, The Year of the Runaways is written with compassion and touched by grace. 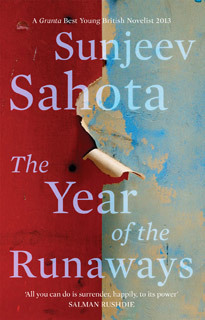 As Tochi, Avtar, Randeep and Narinder negotiate their dreams, desires and shocking realities, as their histories continue to pull at them, as the seasons pass, what emerges is a novel of overwhelming humanity: one which asks how far we can decide our own course in life, and what we should do for love, for faith, and for family.